Waiouru: Disappointed but then funny! 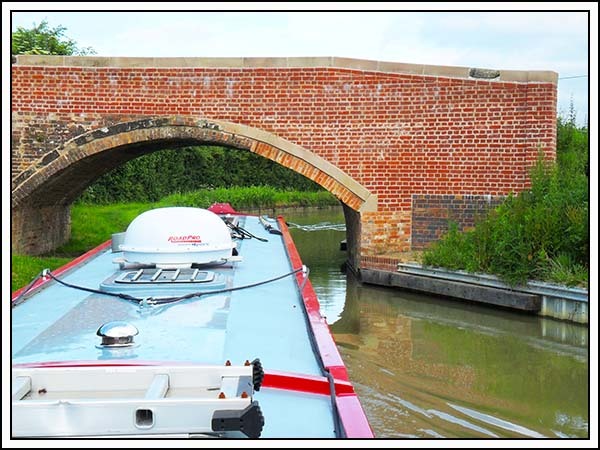 The two boats moored behind us at Braunston departed yesterday afternoon leaving room for two more boats. The first mooring was taken by a boat that arrived around 4.00pm. To Jan’s surprise and annoyance the crew then pulled the boat back into the middle of the gap and proceeded to moor. Their actions meant it would be almost impossible for another boat to moor in the gap either side of them. One assumes this was deliberately done to achieve some type of special privacy. To our minds it appeared selfish! At 5.00pm a hire boat appeared with a large crew of adults and children. Comments “Will we fit in front of that boat?” could be heard. Then “Oh we’re not going to fit!”. The boater ahead of them kindly offered to move up which allowed the hire boat to only just fit into the gap. Oh the irony…… Wanting privacy and your actions result in a crew of boisterous youngsters being moored in front of you so close that their fender is kissing yours. We’re still giggling! Jan had missed out on her Sunday roast because I was away on my walk so we went to The Boathouse for dinner. The pub atmosphere seemed quite subdued with a couple of those quasi police in the establishment. Jan subsequently overheard one of the staff mention there had been an attempted armed robbery the previous evening. It appears the robber may not have achieved much because the takings were in a timed safe. Jan chose the liver, bacon and onion whilst I opted for the steak and ale pie. My meal was good; Jan said hers was tasty but she struggled to find more than one or two small pieces of liver. I thought this was a little offal but then what could you do! Jan fought off my amorous advances during the night. Those of you who eat steak & ale pie will know what I mean! As usual she was up early to bring me my cuppa and biscuit sorting through the overnight electronic correspondence. We departed from the mooring just after 8.00am and slowly cruised up towards the water point at the entrance to the marina passing nb Sanity Again going in the opposite direction with Sheila in the bow as lookout and Bruce at the tiller. It seemed to take ages to fill the tank despite the gauge showing three quarters full on arrival. Whilst we waited I disposed of the old oil from the last service and Jan dumped the rubbish. She was amused to watch the rubbish truck back down the driveway and empty the contents of the Biffa general waste and recycle bins into the same truck. The same thing used to happen at Aldermaston Wharf. Why bother to separate the recycle waste if it all ends up in the same truck! 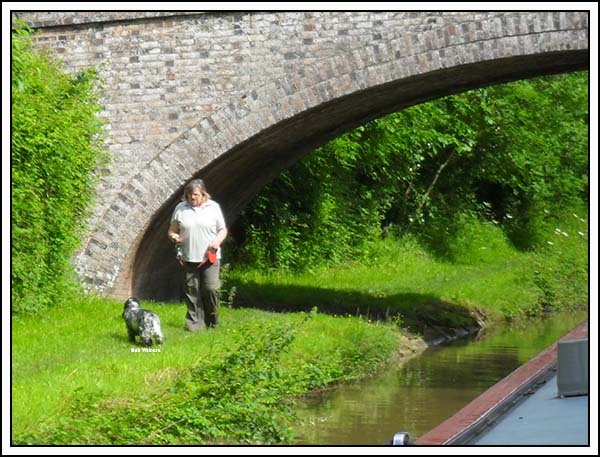 We winded in the Braunston Marina entrance and headed back north towards Hillmorton. We’ve now passed under this bridge a number of times. It’s obviously had some serious repairs and I would imagine the cost was high. Whilst I recognise a desire to maintain heritage structures I cannot help it wonder if the original builders had todays construction options would they be more likely to construct a corrugated steel (Armco) arch culvert. It would be considerably cheaper. I agree we need to retain some of these original bridges…… but all of them? Surely the money could be put to better use? The M45 Motorway (Freeway for any Australian readers) crosses the canal at the southern end of Barby Straight. All that traffic wizzing across the canal. 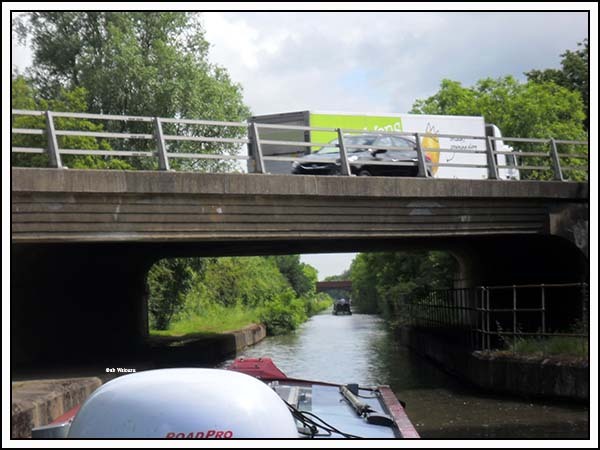 I wonder how many drivers notice the canal and recognise they are crossing a two centuries old motorway! On reaching Barby Straight we caught up with a boat ahead. He was going slightly slower than us which made steering slightly difficult. I’ve discovered Waiouru steers well at 1500rpm but the tiller is very heavy at 1400rpm. 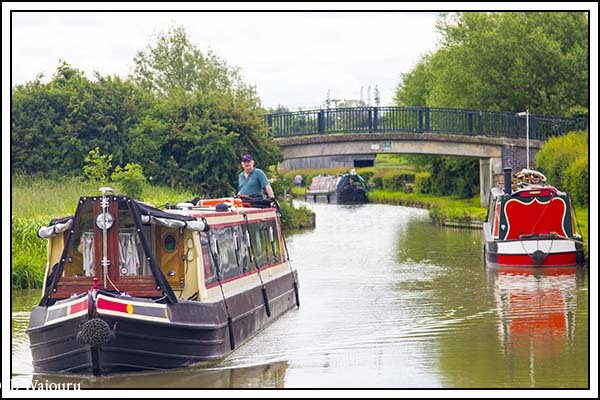 We were going to stop at Hillmorton Wharf Chandlers but there were already boats on the mooring so we pushed on. The friendly proprietor was outside testing plastic thunderboxes composting toilets and remained seated long enough to give us a wave. 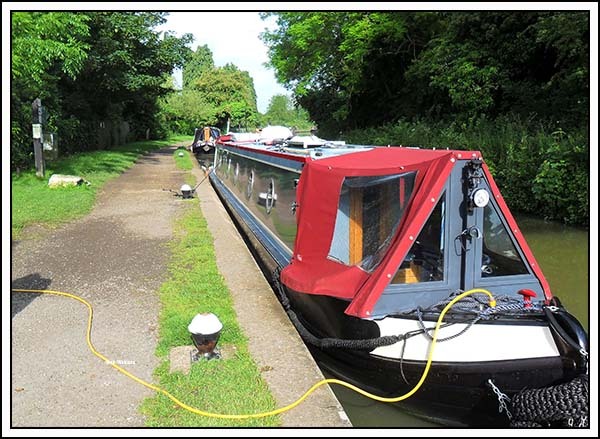 We reached the 14 Day moorings at the top of Hillmorton Locks just before noon and as the batteries had just reached 100% we called it a day! Shortly thereafter Windsong appeared with Pip frantically attempting to remove her bombay bloomers and other unmentionable items drying in the cratch whilst I attempted to get a photo. It’s payback for her photo of our laundry on their blog post yesterday. After lunch i jumped into my one legged ‘onesie’ and removed everything removable from the roof of the boat before i cleaned the centre and port strip. Not having a passion for bananas I don’t have the arms of a gorilla. This means I can’t reach the starboard side from the port gunwale. Anyway, once the centre and port side of the roof was clean I polished the smooth centre strip before scrubbing the gritty port strip. The roof now looks much better (apart from the starboard strip) Of course all of this was done in bright sunlight resulting in some serious dehydration which needs attending to otherwise there might be a medical emergency! ‘Braunston Bangers’ are on tonight’s menu! I have a vision of their passage being lubricated by a cold lager! Most of the work on that bridge (the above water stuff) was done by WRG volunteers. It was one of the first collaborations between volunteers and CRT when it first became a charitable trust. It had been in a terrible state for years. Tom, it would be a great shame if "heritage structures" such as canal bridges were not all maintained. If you say that they don't all need to be preserved, then where would you draw the line? Loss of one bridge would be the start of a slippery slope. As Adam implies, use of voluntary labour kept the cost down here. Does not English Heritage (or CADW in Wales) help with the upkeep of these historic structures? I'm not against keeping heritage but I'm mindful that the pot is shrinking. Being selfish, I'd like to see priority go to dredging and locks rather than rebuilding an old brick bridge to its original state only for it to be used by farm animals. It can't be said the bridges are rare and I can't envisage WRG repairing or maintaining all of them. It doesn't really help navigation if you let bridges get into such a state that they fall down and block the navigation. And don't forget that a lot of the bridges were built for landowners, in return for allowing the canal across their land -- so there's an obligation to maintain them. Precisely Adam. If there previously hasn't been the money to quickly complete minor maintenance then the problem is going to get worse. I didn't advocate not having a bridge but replacing many of the damaged minor bridges with a cheaper modern concrete and steel structure. I'm sure the farmers would prefer the latter as they would be stronger. No. It's a quirk of history which has preserved the canals and provided us with such an insight into our industrial past. Let us not spoil things. If you want modern bridges you have HS2 to look forward to! Sorry Tom, I've probably ranted too much. I'm not against retain the bridges but the bucket of money is not limitless. What is the priority?